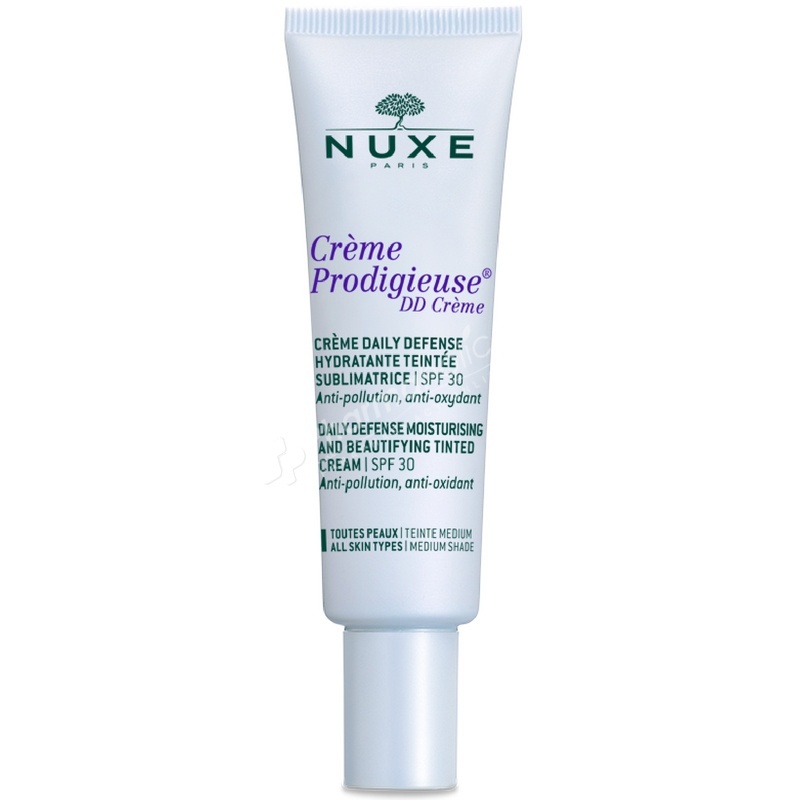 Nuxe Crème Prodigieuse DD Crème Medium Shade Spf 30, offering triple protection from skin oxidative stress and UVA/UVB rays, this moisturising, radiance-enhancing base offers daily defence. Combining powerful antioxidant care with mediumweight coverage, Nuxe Creme Prodigieuse DD Cream SPF30 is a daily wake-up call for your skin. Every day, our skin is vulnerable to external and internal sources. Stress, fatigue, sun and pollution take their toll, skin becomes tired and the complexion looks dull. The Nuxe Creme Prodigieuse DD Cream is your prodigious ally for life in the city, a multi-protective and beautifying product formulated with effective anti-pollution protection. Offering triple protection from skin oxidative stress and UVA/UVB rays, this moisturising, radiance-enhancing base offers daily defence. Blue Everlasting flower ensures powerful antioxidant protection, shea extract reduces the toxic effect of polluting agents, and botanical glycerine moisturises the skin for 8 hours. To ensure a truly healthy-looking, bare skin effect glow, the Creme Prodigieuse DD Cream is infused soft focus mineral pigments, whilst white tea enhances radiance. Its light and melting texture glides over skin with a divine touch, with the discreet scent of Huile Prodigieuse for added pleasure. There are 3 shades available – light, medium, and dark. This Daily Defense cream is ideal all the year long to protect and illuminate the skin due to its UVA/UVB protection. Apply the Nuxe Crème Fraiche de Beaute Enrichie to the entire face day and night for lasting comfort and 24 hour moisturisation. Aqua (Water), Dimethicone, Ethyhexyl Methoxycinnamate, C12-15 Alkyl Benzoate, Diethylamino Hydroxybenzoyl Hexyl Benzoate, Ocyl Oleate, Glycerin, Ethylhexyl Triazone, Octyldodecanol, Peg-30 Dipolyhydroxystearate, , Pentaerythrityl Distearate, Sodium Citrate, Bis-Ethylhexyloxyphenol, Methoxyphenyl Triazine, Mica, Dimethicone Crosspolymer, Parfum, Talc, Propanediol, Capryloyl Glycine, Borago Officinalis Seed Oil, Butylene Glycol, Benzyl Alcohol, Tocopherol, Citric Acid, Disteardimonium Hectorite, Sodium Gluconate, Propylene Carbonate, Camellia Sinensis Leaf Extract, Butyrospermum Parkki Shea Seedcake Extract, Limonium Narbonese Flower/Leaf/Stem Extract, Benzyl Salicylate, Linalool, Limonene, Citronellol, Geraniol. May contain : CI 77891 (Titanium Dioxide), CI 77492 (Iron Oxides), CI 77491 (Iron Oxides), CI 77499 (Iron Oxides).